Let's make this picture perfect. Who painted the ceiling? Where is the Sistine Chapel located? 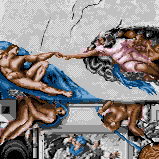 In 1508 Pope Julius II commissioned the artist, Michelangelo, to decorate the ceiling of the Sistine Chapel in the Vatican. He wasn't used to painting on plaster. It took Michelangelo over 4 years to finish painting the 10,000-square-foot ceiling. Much of the painting had to be done in an uncomfortable position. The artist was either lying on wooden scaffolds, or looking straight up. The Chapel's ceiling is breathtakingly beautiful. It is considered Michelangelo's masterpiece. One of the questions references the Teenage Mutant Ninja Turtles (namely Leonardo, Michelangelo, and Donatello, alongside their leader, Splinter).